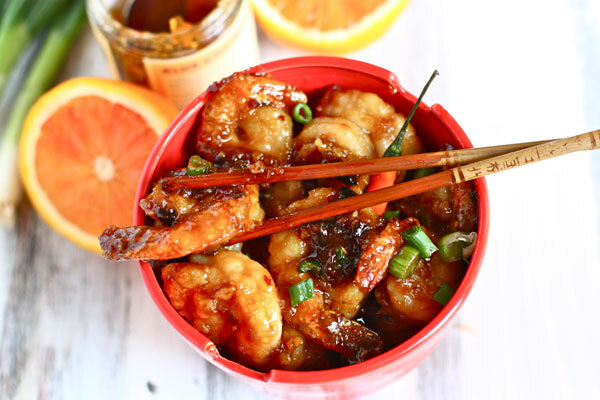 Make the most of your juicy winter citrus with this Chinese take-out favorite! Orange peel shrimp is, hands down, my favorite dish to order at any Chinese restaurant. I love that mix of spicy and sweet! After trying a few at-home versions and not having much luck, I finally discovered the secret ingredient: marmalade. 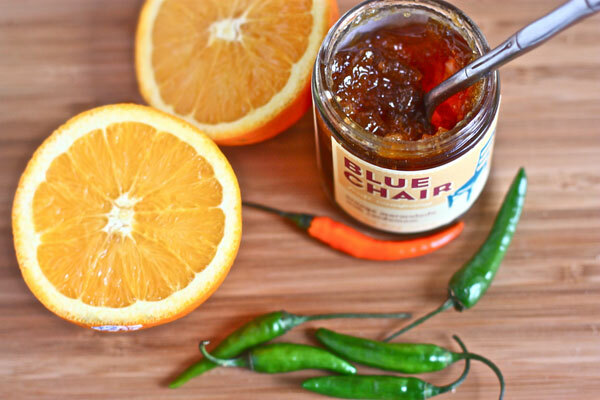 This tangy orange jam lends sweetness and makes the sauce thicken up perfectly, perfect for coating the shrimp. I hope you guys love this dish as much as I do! Pair with brown rice and don’t forget the fortune cookie. 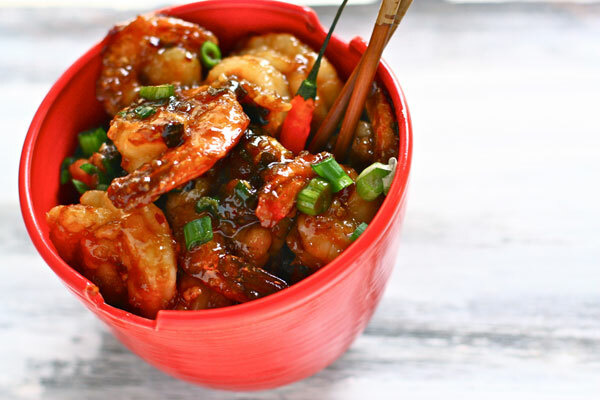 Make this favorite Chinese take-out dish in your own kitchen! 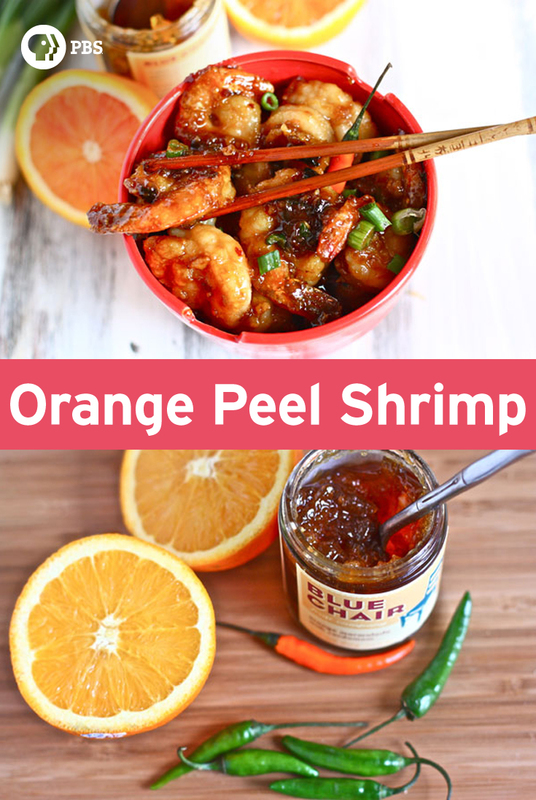 Food blogger Jenna Weber of EatLiveRun.com shares her recipe for Orange Peel Shrimp in this full post on the Fresh Tastes blog. Heat 1 tbsp of canola oil in a large skillet over medium heat. Once hot, add the minced garlic, six thinly sliced scallions (save the other two for serving), orange zest and thai chili peppers. Saute briefly for about two minutes until garlic is fragrant and scallions wilt. Add the soy sauce, orange juice, orange marmalade and red pepper flakes to the pan and stir well to combine. Mixture should be bubbling. Continue simmering until sauce thickens, about five minutes or so. It should become very, very thick. Once thick, turn off heat. Sprinkle the cornstarch on a large plate. Pat the shrimp dry with paper towels then toss in the cornstarch to coat. Heat the remaining three tablespoons of oil in another skillet or wok (I like to use a cast iron skillet for this) over high heat. Once sizzling hot, drop the shrimp in the oil and fry for about a minute or two until shrimp are very pink and curled. The cornstarch should create a crunchy outer coating on the shrimp. Remove the shrimp from the oil and toss in the orange sauce. Serve shrimp over brown rice with additional scallions on top. Don’t eat the chili peppers!